Can business writers learn from Hemingway? The idea may seem crazy. Hemingway was a journalist and novelist. A storyteller. He’s one of the great writers of literature. In 1953, he won the Pulitzer prize for “The Old Man and the Sea.” In 1954, he won the Nobel prize for literature. Isn’t it pretentious for business writers to try learning from Hemingway? But Hemingway takes up a special place in writing. This Nobel prizewinner writes in such simple prose he can even entertain 10 year olds. And you and I both know, he doesn’t dumb down his texts. He shares profound wisdom using simple language. And that’s an amazing skill. Because simple writing helps engage a wider audience—young and old, educated and less educated, native and non-native speakers. But how does Hemingway write so simply? And can we apply his style to business writing? I’m clear enough in the head, he thought. Too clear. I am as clear as the stars that are my brothers. A simple tool exists to measure how readable a text is. This tool is the Flesch-Kincaid score, and it’s available in Microsoft Word and various online tools. The readability score uses average sentence length and the number of syllables per word to work out how simple a text is. The shorter the sentences and words, the lower the readability score. A score of 7, for instance, means the writing is suitable to 7th graders—pupils of 12 to 13 years old. I checked the Flesch-Kincaid score for “The Old Man and the Sea” and it’s a mighty low score of 3.9. The readability score for “The Sun Also Rises” is 4.2 (as statistician Ben Blatt reports in his book “Nabokov’s Favorite Word Is Mauve”). Think about this … Ernest Hemingway was a Nobel prize winning author, and his books are suitable for 4th graders—pupils of 9 or 10 years old. You can use the free Hemingway App to spot your longest sentences, and simply chop them all in two. Not every sentence should be short. Statistician Ben Blatt analyzed all Hemingway’s novels, and found he uses only 80 -ly adverbs per 10,000 words. That’s fewer than almost any other writer. The only exception Blatt found is Toni Morrison. She uses 76 -ly adverbs per 10,000 words. Scrapping your -ly adverbs is another way to simplify your writing, and Blatt’s analysis shows that the writing greats tend to use fewer adverbs. However, it’s not a strict rule, and exceptions exist. Nobel prizewinner Sinclair Lewis, for instance, uses an average of 142 -ly adverbs per 10,000 words. The best books—the greats of the greats—do use a lower rate of -ly adverbs. (…) an overuse of adverbs has resulted in “great” books at a far scarcer frequency. The novels that sell well in bookstores come in with 25% fewer adverbs than the average novel that amateur writers post online. Want to remove the adverbs from your writing? Upload your content to the Hemingway App, and it’ll tell you exactly which words are adverbs. Then, it’s up to you to decide: Keep it, change it, or delete it. Slowly and conscientiously he ate all of the wedge-shaped strips of fish. Weigh up whether a word is necessary or not. Does the meaning of a sentence change when you scrap an adverb? Business writing tends to be full of buzzwords and gobbledygook. Here you’ll find files, folders, and Paper docs you recently viewed. The Files page shows all the files and folders you have in Dropbox. We create products that are easy to use and are built on trust. When people put their files in Dropbox, they can trust they’re secure and their data is their own. If a thief steals a device you have Evernote installed on, they will be able to access your Evernote data as easily as your email, photos, and other applications on that device. To protect yourself against this situation, you should enable the security controls available to you in your device’s operating system. These include setting a screen or passcode lock, screensaver or auto-lock timeout, and encrypting your device’s storage. Hackers might try to lure you to log into a site that looks like Evernote, but isn’t really Evernote. We call this password-stealing attack “phishing.” Before entering your Evernote username and password into a site, be sure to verify that the URL in your browser starts with https://www.evernote.com/ or https://evernote.com. Writing with simplicity doesn’t mean dumbing down your words. Instead, you write clearly and precisely, so your content becomes easier to read and accessible to more people. Writing like Hemingway is about more than using short sentences and scrapping adverbs. Writing clearly is an exercise in thinking deeply. It’s about finding the essence of your idea and communicating it in simple words. This is not just a matter of writing style. I sharpen my writing on Hemingway’s whetstone. You’re right. One should not sacrifice rhythm for brevity. I love the story about what Faulkner said about Hemingway, and how the latter responded. One thing Hemingway didn’t see coming, was the WWW. Hence, he could not predict how important one more aspect of writing would be. That’s where a copywriting hero of mine’s advice became a rule to live by. And because I write be the rules mentioned in this post, and follow the advice of my copywriting hero, I now write for him in a freelance capacity. Of course, your book,”How to Write Seductive Web Copy”, added to my knowledge and understanding, so I’m thankful to you for that. It feels like there’s a lot more to learn from Hemingway than I could fit in one post. Thank you for adding your thoughts, Jansie. I appreciate it! Just added that to my wishlist. Thanks! The reading aloud tip struck me hard. When I do this with my next post, I’ll also record and listen to see how understandable my voice sounds inside a reader’s head. Jotted down other action steps too, Henneke. Thank you so much! Listening to your own writing makes a huge difference. I often read my text aloud twice so I can hear and check the changes I’ve made. Happy writing, Hena. And thank you for stopping by. I found very helpful the summary link at the bottom – your blog is quite big by now. Yes, my blog has become quite big. What surprises me is that there’s still so much left to write about! I don’t seem to run out of blog post ideas. I think it’s “dangerous” to read only business texts as it influences how we write. Business texts tend to be too wordy, with too many flourishes. Reading Hemingway is a refreshing change. What we read influences our writing style, so we should be choose our reading with care. Well, I’ll be going and reading ‘The Old Man and the Sea’ again. 🙂 Excellent advice for business writers (I love how you made the connection), but any type of writer would learn a lot from this post. (Loved the adverb stats!) Every time I read one of your posts, your passion for writing shines through and inspires me! PS Loved your image this week! I feel so lucky to have found a topic (or rather: a business) I’m passionate about. I keep learning more about writing. 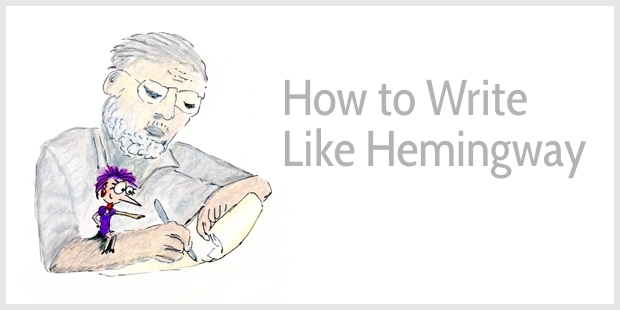 I learned a lot by studying Hemingway’s writing and by writing this article. It also makes me question how I write. Ben Blatt’s book has a lot more interesting stats about readability, adverbs, exclamation marks etc. I’m glad you like the image. I took me a long time before I realized how I could draw “Write Like Hemingway.” It was a good challenge! I am puzzled by the readability scores. In my opinion they come from “ancient” knowledge. With current short attention span (some researchers state that it is down to 9 seconds) and falling literacy, it is a miracle that someone is still reading. If you are writing for Oxford graduates, it works like a miracle but for “normal” audience you really need to go low. When I ran the 10 best monetizing blogs, they have very low readability scores consistently. I think the attention span mainly refers to the time it takes to capture people’s attention. If you don’t capture attention within 9 seconds (some say 7 seconds), then you’ve lost your opportunity to communicate. But once you’ve captured attention, you can try to keep people’s attention for a much longer spell. Even so, a reader’s mind will always wander. According to Daniel Goleman (a science journalist) readers’ minds wander 20 – 40% of the time. Great article Henneke! Switching gears with Hemingway to find rhythm. If writing were design or physics, we could say. which both come back to Occam’s Razor. P.S. Totally unrelated, but how do you pronounce your first name Henneke? Yes, great quotes! Simplicity is such a fascinating topic, isn’t it? The quote I’ve been thinking of is: “Simplicity is the ultimate sophistication” ~ Leonardo da Vinci. Thank you for stopping by, Sean. And I do agree about Hemingway App: most sentences are “too long” and “hard to read” if they are longer than 10 words, which drives me nuts! The rhythm of my text weakens when I check them with this application. But it’s a great tool to find weak adverbs 🙂 So, everything has its pros and cons. Thank you for sharing this article with us, Henneke! Yes, I agree with you. The Hemingway app is useful to point out adverbs (and long sentences) but it’s always up to us, as writers, to decide whether we make any changes or not. Thank you for stopping by, Lesley. I appreciate it! Brilliant post, as usual. Writing style to aspire to. Yes, I agree – something we can all aspire, too. I’m also still learning! Thank you, this post was beautiful and helpful!! <3 And I also adore Hemingway's style of writing, it's like a dance. You’re making me blush, Cathy! The Old Man and the Sea is one of my all-time favorite books. Thanks for sharing a few delicious quotes and bringing it back to mind again, and for making it more clear what makes it so good. It’s probably on my top ten list of favorites, too. I’m curious … what else would be on your list? Writing like Hemingway, especially for business purposes, what a fascinating subject, Henneke! Thank you for putting this together. This was the first time I tried to draw a real person. It was quite a challenge. It’s not the same as drawing a cartoon character (which is way easier). Thanks for the heads up – you’re right, and I’ve corrected it. Good to see you again, Stan! But, seriously, I second Cathy Miller and I really love the quote Jansie added. I also agree with you that reading writing that’s not always business-only lends great ideas and styling to consider for our own writing endeavors even for business context. Still, you remain the queen in concise and clear biz writing and I can only aspire to join your court! Haha! Exactly is one of my problem words, too. It keeps sneaking into my writing. The other sneaky -ly adverb is totally. I have to edit these two out of each piece of writing. It still amazes me that people like you keep reading my posts. How come I’m not boring you to death yet? I guess we all have a similar fascination for writing. I appreciate your support, Sue-Ann. Your posts are a must read for me. They have absolute power and punch. I have to read your posts several times just so that some of your writing skills can rub off on me. I had one question to ask. It would be great if you could share it on your blog or even in your regular emails about them. Even if I read one of the ten books you mention, it would add a lot of value to my writing. Always a student of writing. Thank you so much for your lovely comment, Amit. It’s on my list to write a post about the books I recommend for business writers. But it might be a while before I put that together. Or are you more interested in non-fiction? That’s a big list. Thank you. This will be enough to keep me busy till you come out with your post. Another brilliant post. Your posts have become compulsory reading for me. I love the way you weaved the excerpts from The Old Man and the Sea into the post. I’m going to reread the book too. A great lesson in the art of simple writing. Thank you for ‘ sharing your wisdom ‘ Henneke. I keep re-reading and re-reading those excerpts from The Old Man and the Sea. Just love them. Thank you for your lovely comment, Poovanesh. an inspiring post. Enjoyable read as usual. And the excellent comments too. Such an audience you have! Good to see you again, Barry! I learned so much from this blog post. So thank you so much for sharing. I’ve noticed that bloggers like James Clear, Darren Rowse, and Sue Dunlevie use simple language. This blog post instantaneously reminded me of these bloggers. In addition to that, I always admire your writing as well. What I learned from this blog post is that simplicity in writing has its importance. My takeaway is that one should be open to learning new perspectives. For example, I have read that a blogger must be writing short sentences to keep the readers engaged. But today I heard the same thing in a broader perspective. Thank you for stopping by, Hassaan. I appreciate it! Thank you, Henneke. What a simple and brilliant post. Indeed, why don’t learn from the best? I read “The Old Man and the Sea” when I was child, and I still remember feelings of admiration and delight. Mostly because of the language, simple and so visual at the same time. I think, I’m going to reread Hemingway in English soon. And, of course, I already made notes in my mind on what to remember when I write. Hi Irina, I found it such a treat to re-read “The Old Man and the Sea.” I appreciate it even more now than when I read it before. I guess it’s partly because I realize how hard it is to write so simply and yet so beautifully. There’s so much to learn from him. Thank you for stopping by again, Irina! I recommend you to all my writer friends. We so often hear about using short sentences and scrapping adverbs. A great critique. If all sentences were short, that would be boring. Instead, we should be finding the right balance between long and short sentences. Yes, I agree. Some of the advice in blog posts is a little too strict about short sentences and adverbs. As writers, we should always decide whether suggested changes work or not. Also, it’s also a matter of style. Not everyone has to write like Hemingway. Some writers like a few more embellishments – that’s how we shape our voice. This is something i keep struggling with. The balance between simplicity and vivid writing when you’re writing a text that’s supposed to sell. Simplicity seems elegant. And i like the “no hype” type of marketing. It’s clean. On the other hand your client is often competing with a lot of like minded businesses where vivid writing might help set it apart. Or at least not make it feel too bland. How do you approach these situations? Also, you don’t have to write as simply as Hemingway! Writing like Hemingway is a daunting task. His mastery of words seems difficult but not impossible to match. Are we ready for the challenge? I am. Are you? Thank you for stopping by, Gail. Happy writing! Mark Twain had the same advice for adjectives. These are great quotes from Mark Twain. Thank you for sharing, Tim. I appreciate it! Well this was the nicest stuff so far. I am glad you liked this article. Happy writing! Thank you for making it simple. I now understand what is required to make a good write up. It’s about learning, I have a lot to learn from you. Thank you, Confidence. Happy writing! Yes, that’s both the challenge and beauty of writing … there’s always more to learn. Enjoy! I agree wholeheartedly (oops). Simple is better. As you say it’s a great way to expand our audience. We must be ruthless by removing superfluous words that add nothing to the content. I’m glad you like this one, Kim! Simple writing is easier to read but harder to write. It does take effort.